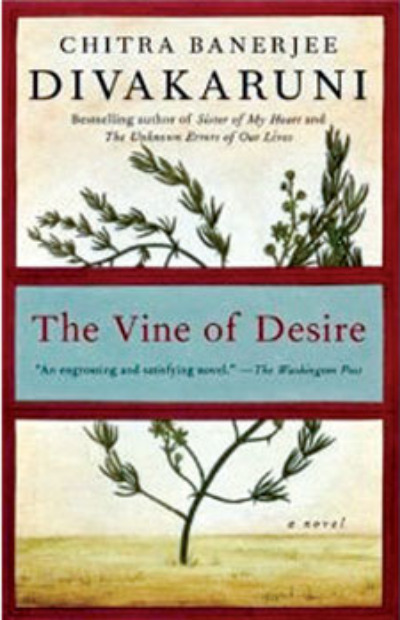 Vine of Desire continues the story of Anju and Sudha, the two young women at the center of Divakaruni’s novel Sister of My Heart. Far from Calcutta, the city of their childhood, and after years of living separate lives, Anju and Sudha rekindle their friendship in America. The deep-seated love they feel for each other provides the support each of them needs. It gives Anju the strength to pick up the pieces of her life after a miscarriage, and Sudha the confidence to make a life for herself and her baby daughter, Dayita-without her husband. The women’s bond is shaken to the core when they must confront the deeply passionate feelings that Anju’s husband has for Sudha. Meanwhile, the unlikely relationships they form with men and women in the world outside the immigrant Indian community as well as with their families in India profoundly transform them, forcing them to question the central assumptions of their lives.